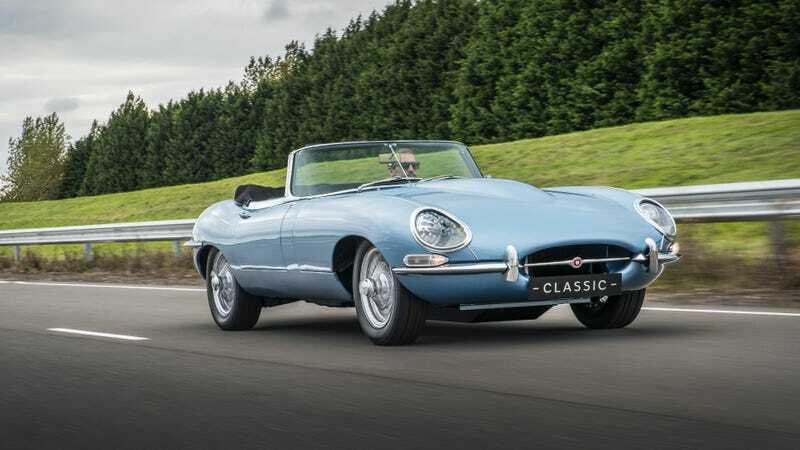 Stuffing an electric drivetrain into a drop-dead gorgeous fully-restored 1968 Series 1.5 Jaguar E-Type Roadster may just be my new favorite idea ever, and that’s exactly how the Jaguar E-Type Zero was made. Jaguar Land Rover Classic Works in Coventry, England, made the conversion, keeping most things stock to the Series 1.5 E-Type, save for more efficient LED headlamps, modified instrumentation and fascia and a 220 kW electric powertrain—some components of which were borrowed from the upcoming Jaguar I-Pace. That new motor is fed by a 40 kWh battery that has roughly the same dimensions, same placement and a similar weight to the E-Type’s original V6 XK engine. Jaguar claims it has a real-world range of around 170 miles, and can be fully recharged in six to seven hours. That new electric drivetrain all packaged very cleverly to resemble the original car, with the electric motor and reduction gear just behind the battery pack where the gearbox would have gone. A new propshaft directs that power back to a carry-over differential and final drive. Best of all, the entire package is about 100 lbs lighter than the original, and the front-to-rear weight distribution did not have to be changed, making the whole drivetrain somewhat plug-and-play. If the owner wanted the original petrol-powered XK engine back in its place, they could relatively easily do that. In order to seamlessly combine the new electric powertrain of the E-type Zero with the dynamic set-up of the original E-type specification, we have limited the vehicle’s power output. We believe this provides the optimum driving experience. While I’d also love to see a lighter E-Type Zero with more power, I also realize that this will prevent classic E-Type bodies from getting wrapped around trees by rich doofuses. Our aim with the E-type Zero is to future-proof classic car ownership. We’re looking forward to the reaction of our clients as we investigate bringing this concept to market. The E-Type Zero is set to make its debut at Jaguar Land Rover Tech Fest at Central Saint Martins, University of the Arts London this week, which runs from September 8-10. Please borrow it to do the classiest, quietest donuts ever. Happy 50th anniversary to the "world&apos;s most beautiful car"